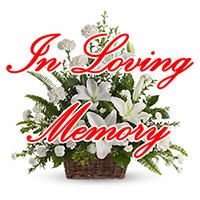 Carolyn Lee McInnis, 77, passed away on Tuesday, April 2, in Melbourne, FL. She was born in San Antonio, TX and was a member of the Red Hat Society. Carolyn is survived by her 4 children, Steve, David, Donna and Greg, 7 grandchildren and 2 great-grandchildren, sister, Barbara Judy. Services will be held, Sunday, April 14, at 4:00 pm, at the First Baptist Church of Melbourne.